In this house there is no question we are all about Disney. 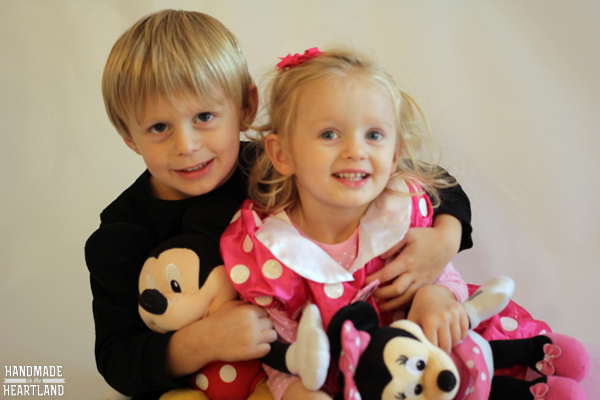 I think I kind of set out from the beginning to “indoctrinate” my kids with disney because I love it so much. Four years ago, before we had kids, Matt and I went to Disneyworld with my then 11 year old sister and as anyone would tell you I was by far the most excited one there. 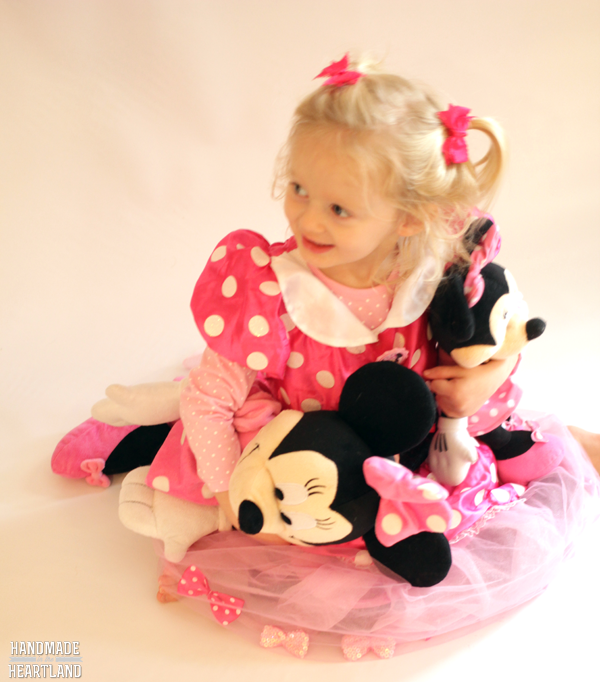 So it thrills me to no end that June has latched on to Minnie Mouse as her favorite thing right now. And by favorite I mean totally obsessed, she doesn’t even talk all that much yet but she will tell you to go get her stuffed Minnie at bedtime if it’s not in her bed, or demand to wear her Minnie pj’s! 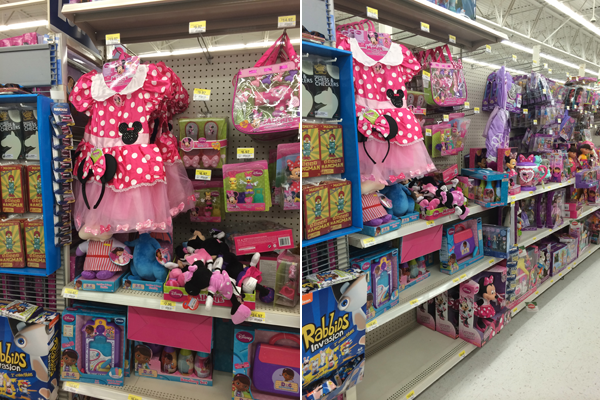 We have a Minnie shirt that is worn the first day after laundry day every week and when we walk into Walmart she spots the Minnie balloon floating about the cash registers within minutes. 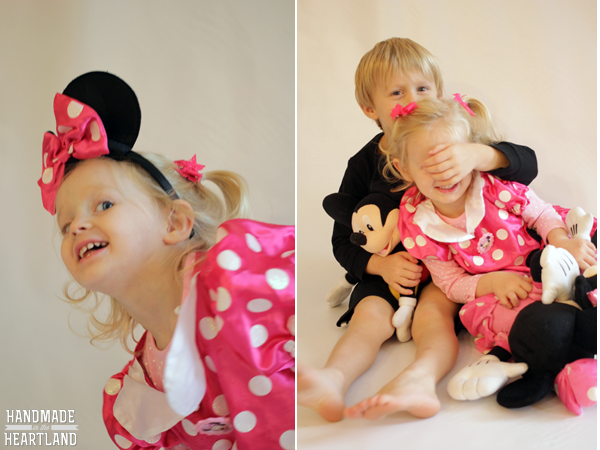 So its no surprise that she just adores her Minnie Mouse costume. 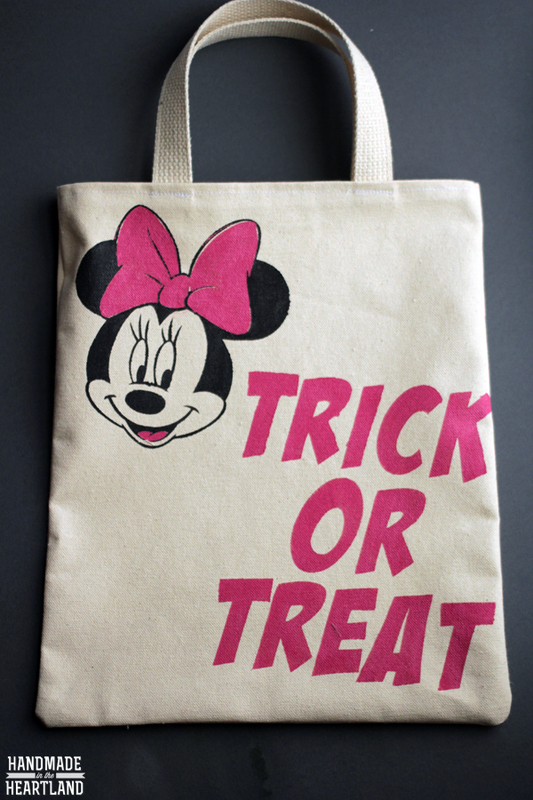 I’m excited for this Halloween, I think its going to be so fun that both of them will enjoy it and for the occasion I made her a Minnie Mouse trick or treat bag. Its a fun simple DIY that anyone can do. 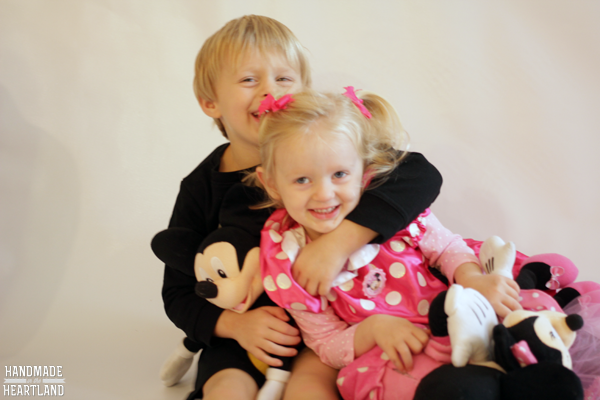 Max has always been a Mickey’s clubhouse fan and although he’s kind of moved on to Superheros and other boy things he still loves to play with his sissy and watch Mickey every once in a while. I’m dying to take them to Disneyworld, a lot of my friends have gone this year and so I’m starting to plan a trip for us- next year is the year! These two can be so fun when they choose to be happy together, really it all depends on Max’s mood because June is much more easy going but if someone is taking her toys and picking on her its screams all around. However many screams happen in our house everyday they are totally worth it for the moments that I see these two play together, when Max talks to her and genuinely wants to make her happy, totally melts a mothers heart. 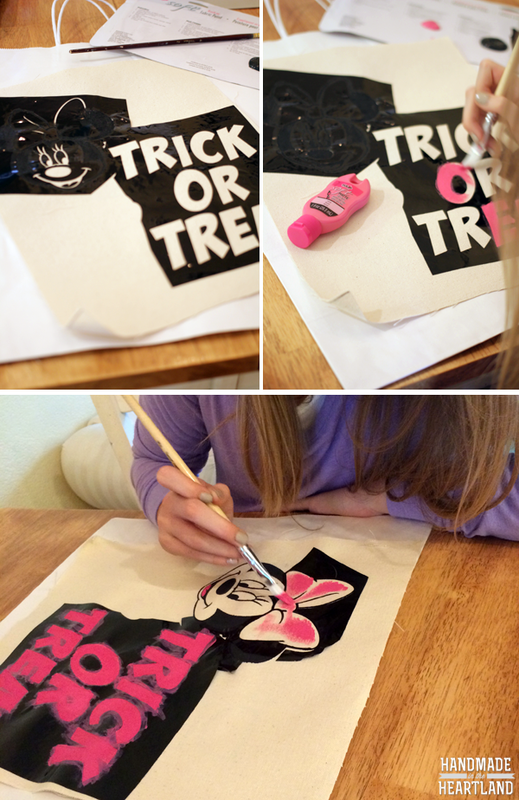 I purchased June’s costume at Walmart because, lets be honest, sometimes you just don’t want to DIY some things but this trick or treat bag is so simple to make and only takes an hour or two. There are so many fun disney things to buy but sometimes its nice to be able to make something too, even better when it looks adorable! The first thing I did was design the image I wanted on the front of the bag. I used my Cricut explore to cut the vinyl stencil and so first I designed the text in illustrator and uploaded it. 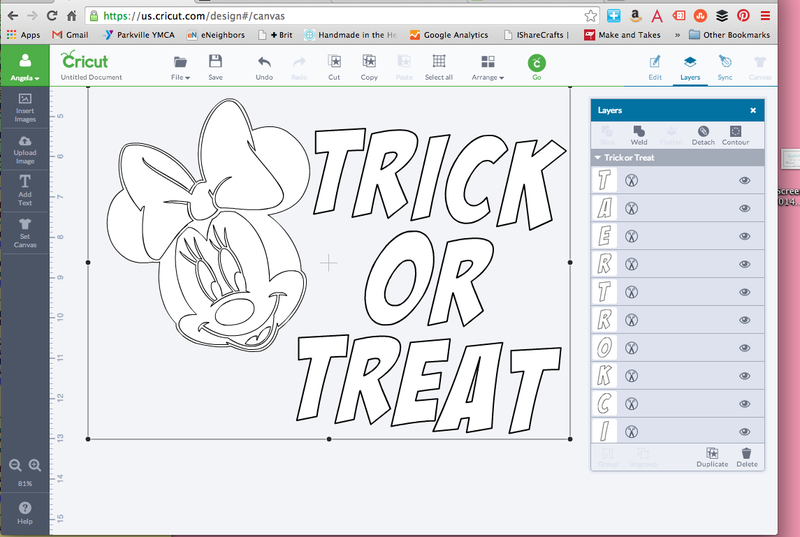 You can download the SVG file that says “trick or treat” HERE . 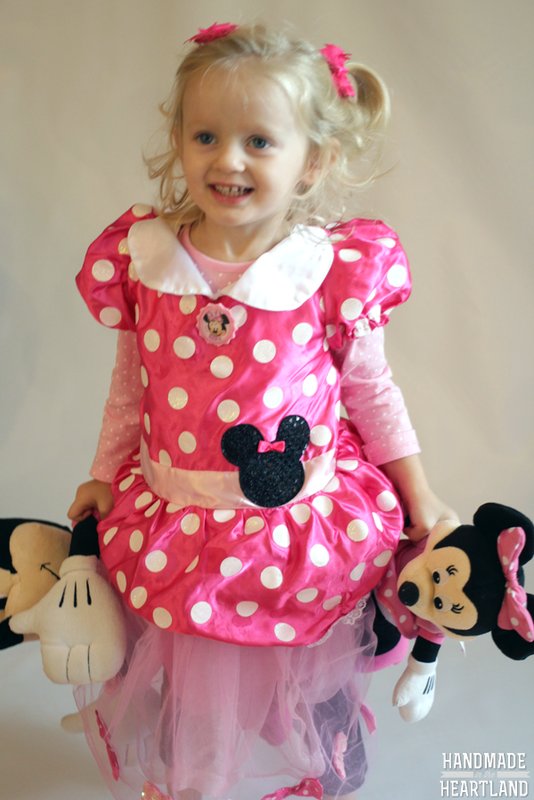 Then if you go to insert images and type in Minnie Mouse several images of Minnie will pop up to purchase for $1.49. I chose just a face image and that’s what I would recommend. 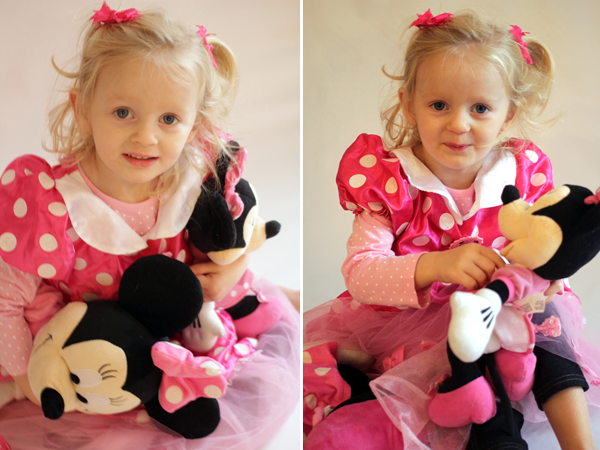 I changed the color of the minnie to all white and then used the attach button to connect all the shapes and create just 1 cut image instead of multiple in different colors. After cutting the vinyl I used transfer paper to put it onto the canvas, you can see images of that process in THIS post. The vinyl was kind of tricky to get off the transfer paper because it didn’t want to stick on the canvas as well as other materials, so I had to be very gentle when removing the transfer paper. Once the vinyl was positioned on my canvas I used tulip soft fabric paint to paint the images. To paint Minnie I removed any of the parts of black vinyl that needed to be painted black and then after those areas were painted black I removed the vinyl and painted the tongue and bow pink. I will say that you could make this project even easier by just purchasing a blank canvas tote from a craft store and totally skipping the next steps of making the bag. 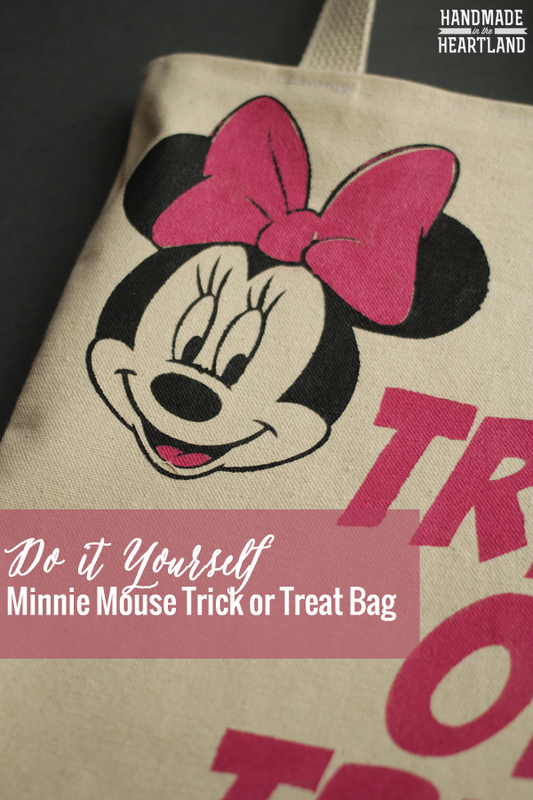 In an effort to not go to the craft store with the adorable kids that are featured in this post I opted to make a bag because I already had handles and canvas at home. 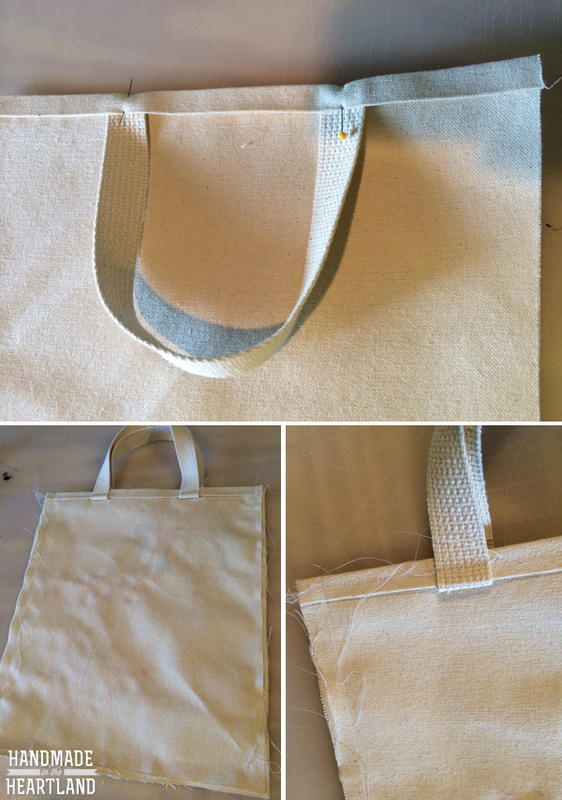 🙂 Truly this is the most simple sewing project, a totally basic tote. 1. First take both pieces of canvas and on one of the short sides fold over the fabric 1/2″ twice so your raw edge is folded inside, not visible. You’ll then take your handles and pin them into the fold (like the top picture) measure to the center-6″ and then place the handles 2″ from either side of center, so there is 4″ in between each end of the handle. Again you’ll be doing this to both pieces of canvas. 3. Pin both pieces of canvas with finished handles together, right sides together. Sew all the way around the sides and bottom at 1/2″. 4. 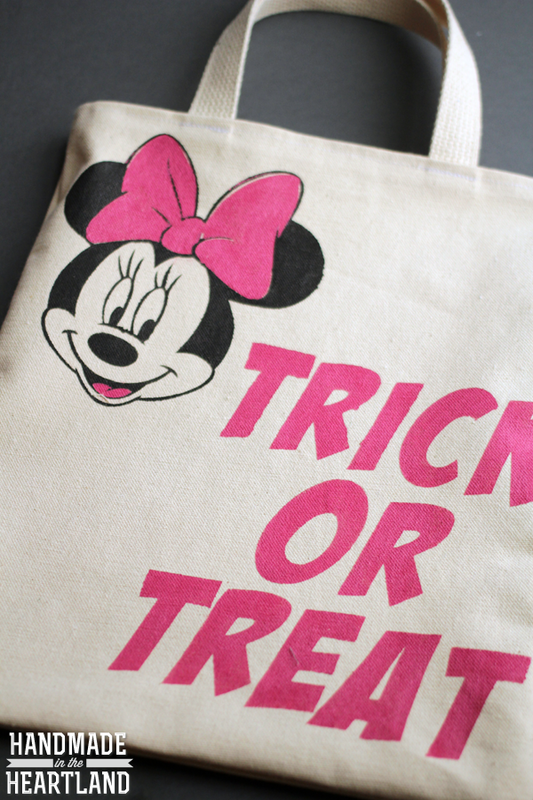 Turn your bag right side out, pus your corners out through the inside of the bag and voila! you’re done! The painting part of this project could easily be done before you sew or after. 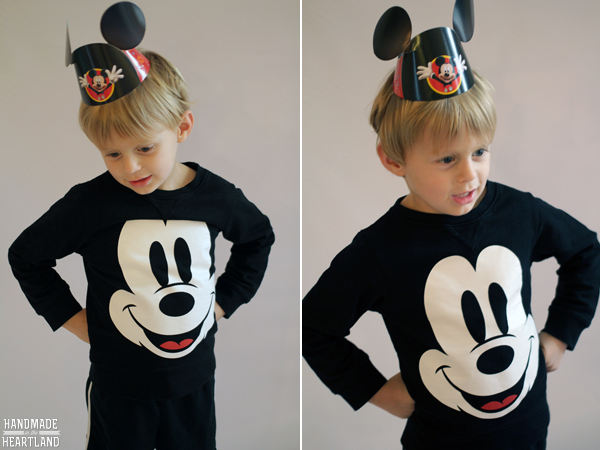 Celebrating with Minnie Mouse has never been easier. For June’s birthday party I purchased adorable plates, party hats (like the one Max is wearing at the top of the post), tablecloths, napkins, etc. you know the whole shebang. 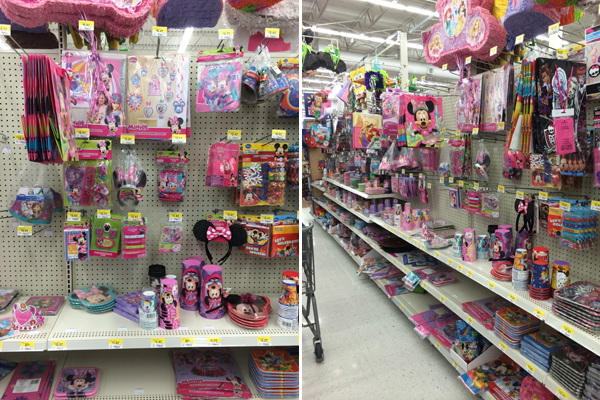 Walmart has a great selection of Disney Jr. party supplies! 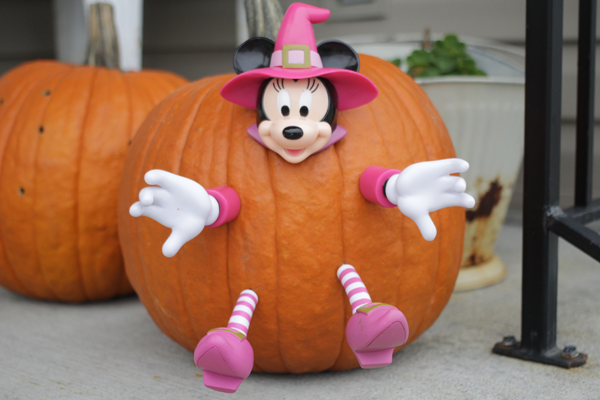 I couldn’t help but share June’s pumpkin this year, of course it’s Minnie. What an easy way to decorate a pumpkin, no?! What are your kids going to be for Halloween? Who are the favorite characters in your house?